KARL: Not having an iron in the hotel room really gets me. Or if there’s one of those ironing rooms you’re starting to see these days. What do they expect me to do, walk across the hallway in my underwear to get the creases out of my shirt? RAPID: Ha. It’s one of those things isn’t it? The iron situation. But no one ever packs a travel iron. KARL: Yeah. I guess you could. But travelling light on a business trip, who really wants to have a travel iron stowed away? If the hotel can’t provide you with one for your room, it’s probably not a hotel you should be staying at. It’s one of the things people often forget to check, but we always do. RAPID: What else do you find people tend to forget about when travelling on business? KARL: It’s an obvious one, but parking is a big deal. Yet it’s too often overlooked. It’s one of our main considerations when booking hotels for clients. Aside from checking there is adequate parking in the first place…you’ve also got to consider how close it is to the hotel, the security, the size. If you’ve got a big group of contractors, say, and they’re all travelling in decent size trucks, it’s something that you need to sort. RAPID: And it’s something that’s not always clear on comparison sites, right? KARL: No. Exactly. Often you’ll see that a site says a hotel has parking, but when you actually dig deeper, it either costs extra or is a mile away from the hotel. To say parking is available on those sites, the bar is pretty low. It’s why we do those extra checks to make sure the client is well covered for what they need. RAPID: It’s those little details that people forget when booking business accommodation? KARL: Yes. But it’s difficult for our clients. In most small to medium size businesses…even in larger businesses…there’s not really someone specific who’s responsible solely for booking business accommodation. It often comes down to a last minute thing for the HR manager or office secretary, searching online for a few hours for what they hope will be the best deal. But it ends up costing more than they’d budgeted for and takes up valuable time they could be doing something else. That’s where we come in. We can take it all off the company’s hands so they save a ton of time. And thanks to the way we work, we can often get cheaper deals and pass that saving onto the client. RAPID: We were talking about the iron issue…and how no one travels with one. But that’s the one thing you DO always travel with? RAPID: Just phone? Or do you travel with other items? KARL: Sure the phone is important, but most hotels have phone chargers available if you need them these days. Less so chargers for laptops, tablets and things like that. I always travel with my MacBook, so making sure I’ve got the charger is crucial. I should buy a spare to keep in the boot really. RAPID: How do you relax when you’re working away from home…do you watch films, television…you’re a Bond fan, right? KARL: I do like the Bond films. I thought Casino Royale was great and was glad to see them take it back to the books. But when I’m on the road, I don’t watch too many films or TV. I’m a real foodie so like to check out the local restaurants and see what’s going on. I use TripAdvisor a lot to see what’s got a decent review. KARL: Most recently, I ate at Hawksmoor down in London. That was very good. A bit pricey, but a great steak. I am a bit obsessed with steak so wherever I am I try to seek out a good one. RAPID: Aside from the steaks, and helping our clients of course, what else do you like about working here at Rapid Accommodation? KARL: Obviously I’m really proud of how far we’ve come in such a short space of time. The team is great. Our clients are happy. And we’re growing all the time. We’ve got our sights on going international now, which is going to be a huge challenge, but I think will be great for the company. And I guess that’s what I like about working here. It sounds weird, but it’s the challenge. Every day is different and our clients are always throwing up new things for us to fix for them. We love that, though. At least, I know I do. Being presented with a new problem and then figuring out how to overcome it is rewarding in itself and then when a client thanks us too, it rounds it off. We’re pretty self-taught here, so the fact that we’re delivering such a great service feels good. RAPID: That’s great. Thanks for talking to us, Karl. Any final thoughts, for now? KARL: No problem. It’s good to share what we’re doing here; it’s exciting. For the record, though, I know I’m known as ‘the spreadsheet guy’ but I don’t even like spreadsheets, you know? I think it’s unfair us financial types get lumbered with a love of Excel. RAPID: But if you’re not taking care of the spreadsheets…who is? At this point, Karl left the interview looking suspicious. And despite his denial, we all know Karl is still ‘the spreadsheet guy’. 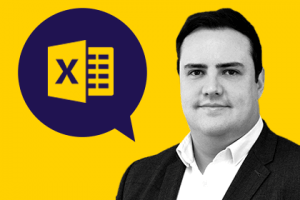 The good news is: it’s thanks to Karl’s knowledge of finance and all things Excel that we’re often able to help firms save so much money when it comes to their business accommodation.